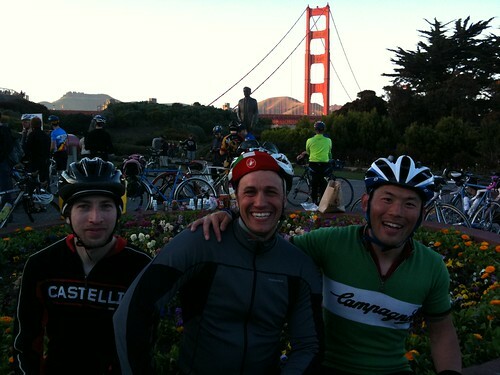 Yesterday was the first brevet of the San Francisco Randonneurs 2011 brevet calendar. It also marked one year since my very first brevet with the SF Randos. It’s been a little over a month since the surgeon gave me the okay to get back on the bicycle and I was really pleased to feel like I was in shape enough to give this brevet a go. It’s a beautiful course that starts at the Golden Gate Bridge, heads north then a little west through the Pt. Reyes National Seashore then meanders back to San Francisco. On a sad note, this ride was dedicated to Don Mitchell who passed away in November after being struck by a car while riding his bicycle. The SFR 200k was Don’s favorite brevet. I had the chance to meet Don while he was volunteering at the finish control of last year’s Russian River 200k. He had just completed the Devil Mountain Double Century the day before which is over 200 miles and over 20,000 feet of climbing. Despite such a great accomplishment, Don was very humble about his achievement. He also politely declined when some friends and I offered to make him a peanut butter, jelly, and potato chip sandwich. Don left us too soon and will be missed. All in all, this was a great 200k to start off the season. There wasn’t a single drop of rain (last year it rained a little) and the weather was absolutely ideal. It was also the largest brevet the SF Randonneurs hosted in history with 150 riders attending and another 20 on the wait list. (This is the only ride with a rider cap because of restrictions imposed by the Pt. Reyes National Seashore.) My left leg is still a little atrophied and my pedal stroke is a bit lopsided based on the fact that my right (stronger) leg started to cramp up while my left leg never did. I think I was also a little under gunned because I noticed on most of the climbs, my pedals wouldn’t spin nearly as fast as anyone else’s. But despite all these factors, my friends and I still managed to finish in just under 10 hours, besting last year’s attempt by about an hour. This year I would really like to attempt a Super Randonneur series (200k, 300k, 400k, and 600k in a calendar year). There’s a lot of talk of this year’s Paris Brest Paris which is a 1200k ride in France that is kind of like the Olympics of randonneuring and happens only once every four years. I’m going to focus on the Super Randonneur series first, which is an intimidating task, then we can talk. Here’s the Strava upload by the way.